On Saturday, the Blyth Festival wrapped up its 44th successful season one week later than originally anticipated thanks to an extended, sold-out run of The New Canadian Curling Club. Artistic Director Gil Garratt said that the Festival brought over 25,000 people to Blyth this year, which is a great season compared to those of recent years. That figure, he said, is an improvement of over 8,000 patrons when compared to last year’s attendance, which is a very encouraging trend. The upwards trend, he said, was joined by a rise in fundraising for the 2018 and a banner year for ticket revenue. Breakout hits from the season, Garratt said, were The New Canadian Curling Club, which he said is sure to be produced again across Canada, and Wing Night at the Boot. Those two plays are in addition to a remount of last year’s standout production, The Pigeon King, and Judith: Memories of a Lady Pig Farmer and 1837: The Farmers’ Revolt, which both inspired some audience members to see the show a second time. Garratt said that 1837: The Farmers’ Revolt gave the Festival an opportunity to reach out to local high schools in its final week of production, something Garratt had always wanted to do. The Festival offered free tickets to high school students who could arrange their own transportation to Blyth and two schools, one in Clinton and one in Listowel, took advantage of the offer. He admitted that the show “wasn’t everyone’s cup of tea”, but maintained that it was an important show for the Festival to produce. Not only is it important in the history of Canadian theatre, but as a show that led to the very formation of the Festival, it’s imprinted on the organization’s DNA, he said, despite not being produced at the Blyth Festival until this season. “I’m incredibly happy with the whole season,” Garratt said. He added that the shows were all very different from one another, which made for a very diverse season. Not only did the season offer something for everyone, he said, but it also showed off the versatility of actors and crew members. He also pointed to the Phillips Studio shows as a source of pride. For the second season in a row, The Downs sold out its run, while Jane Miller’s These Are The Songs I Sing When I’m Sad also inspired enthusiastic support from those lucky enough to see it. He also said he’s very proud of Wing Night at the Boot, a show which he co-created alongside the show’s actors and director Severn Thompson. Producing a show full of characters, stories and events that wouldn’t have made their way onto a stage anywhere else in Canada, he said, is some of the most important work the Festival does. In addition, he said that producing a show about an establishment mere steps from the theatre is also a crucial aspect of the stories the Festival tells. Garratt said that he spent 20 years on stages in Toronto and there was only one time that he performed in a show that took place in Toronto. To be able to produce a show in a community where the stories being told took place is a special aspect to the Festival’s relationship with Blyth. 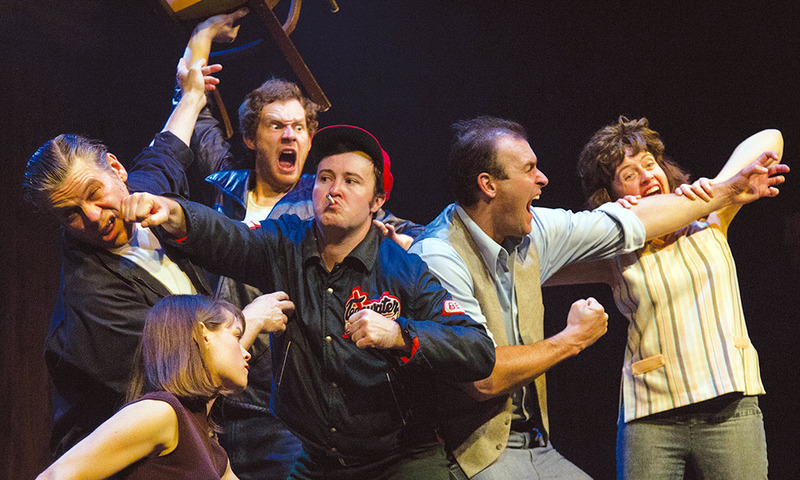 While Garratt co-created the show alongside this year’s company of actors and Thompson, he also had the opportunity to act in the final show of the run. With actor Daniel Roberts unable to perform in the production’s final show, Garratt stepped in and said he and the crew had great fun with his first and last acting performance of the season. 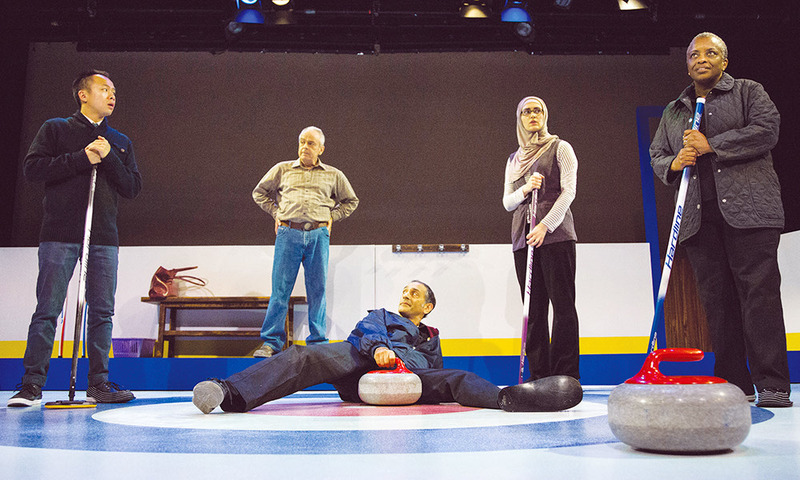 With playwright Mark Crawford’s New Canadian Curling Club, Garratt said that it’s another case of the Festival being on the ground floor of a show that’s bound to be huge. 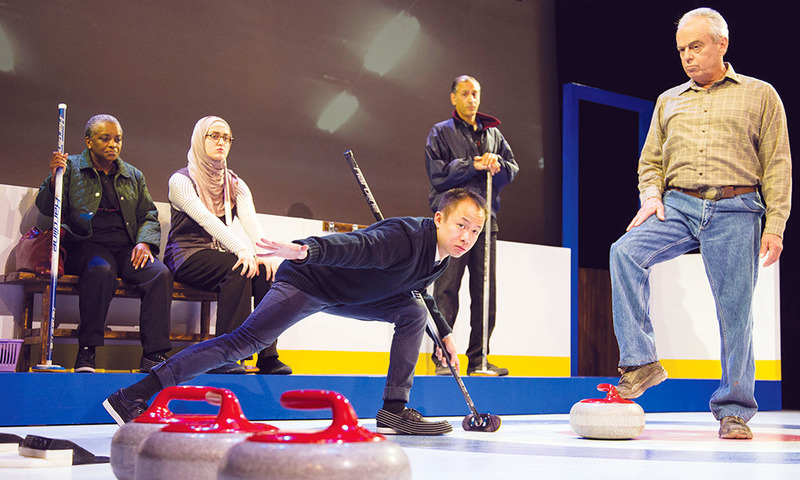 With several shows left in its run, The New Canadian Curling Club sold out, demanding an extended run from the Festival. The Festival added five more shows and those shows would also eventually sell out as well. Garratt said there are two stories from The New Canadian Curling Club’s run that sum up the on-stage experience. First, he said, the Festival had to invest in a small, on-stage projection system after the first preview show. With all of the projections coming from a projector mounted on the balcony during that first show, the projected backdrop was literally shaking and affecting the show because the audience was laughing so hard it shook the balcony, and as a result, the projector as well. However, to bring the play’s more serious side home, Garratt remembers a production of the show that welcomed two Syrian refugees from Seaforth to Memorial Hall. Crawford had consulted with the Seaforth residents about what it was like to be a new Canadian (and a new curler). Garratt said that seeing the show, for them, was a very emotional experience. He has no doubt that the show will go on to do great things in theatres across the country.